Read-out Instrumentation Signpost: Light guide/light pipe systems. Foremost Electronics is now offering its British customers flexible light guide/light pipe systems from the long established manufacturer Mentor. These flexible light guide / light pipe systems offer an elegant and cost-efficient solution for many opto-electronic design challenges - not least for a minor design change during a product mid-life-cycle face-lift. 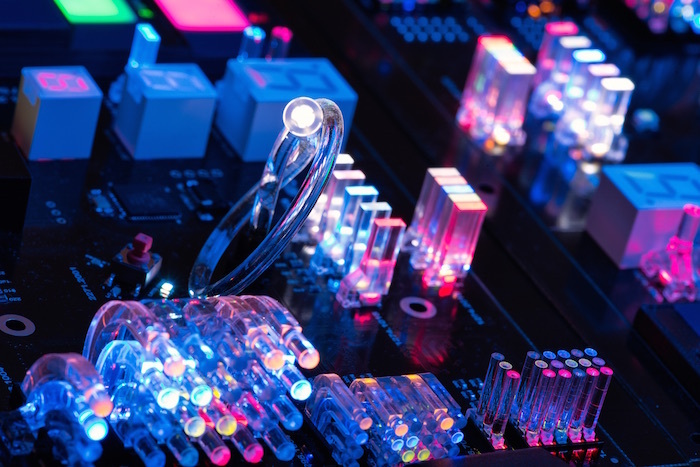 The most popular versions are designed for use with SMD TOP LEDS. These light guides push-fit into a Polycarbonate housing that is mounted on the PCB with two press-in lugs. As standard, a transparent lens is supplied for use at the visible end. Alternative coloured lenses are available, as are custom lengths. Mentor offers other flexible solutions for SMD and THT LEDs with 1000 μm, 2000 μm and 3000 μm fibres. They also offers a range of flexible "M-Tube" light guides / light pipes. Unlike conventional light guides, these are designed to emit homogenous light along their entire length (up to 2M). They are ideal for cosmetic illumination of large control panels and have a myriad of other uses limited only by imagination! Sales manager for process analysis! Test & Measurement representation in Benelux.